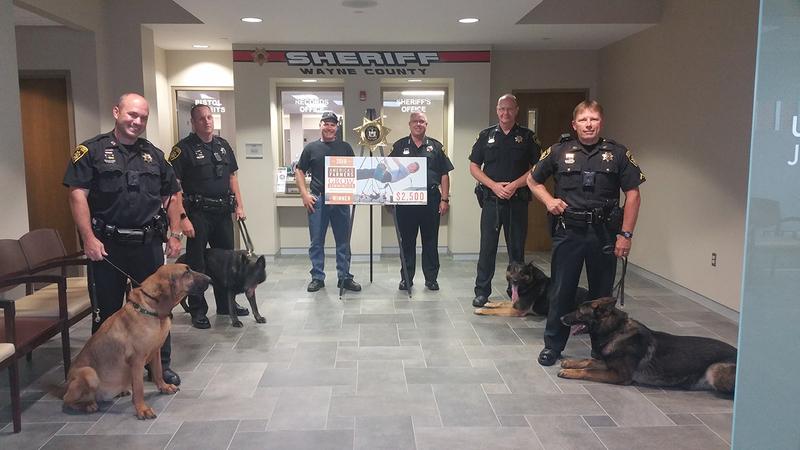 The Wayne County Sheriff’s Office has been chosen for and received the 2018 America’s Farmers Grow Communities Donation from the Monsanto Fund in the amount of $2,500.00 for the Sheriff’s Office Canine Team Fund. Thank you to Ryan Gansz for his connection, support and assistance in applying for and receiving the 2018 America’s Farmers Grow Communities Donation from the Monsanto Fund. Sheriff Virts truly appreciates the contributions made by various individuals, organizations and corporations in Wayne County and surrounding areas to support the Sheriff’s Office Canine Team. Pictured (left to right); Deputy Pitt with K9 Mazie, Deputy Yates with K9 Noris, Ryan Gansz, Sheriff Virts, Sergeant Lorenz with K9 Tyson, Deputy Roeland with K9 Majo.